This is the first time the true inside story has been told although I do touch on it in my forthcoming biography. The front of the "Cavalcade" Cinema. 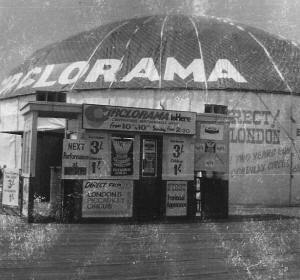 The "Circlorama" process was developed by the Russian professor E. Goldovsky, Moscow Cinema Research Institute. 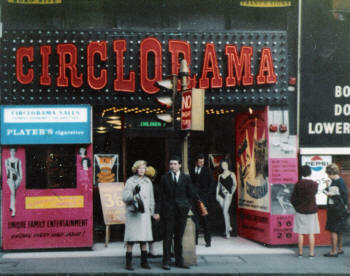 The London Circlorama cinema opened 9 May 1963. The circular auditoria measured 18 meters in diameter and had a height of 15 meters. The screen surrounded the audience and had a total length of 45 meters. The lower edge of the screen was raised 2½ meters above the floor. 11 projectors, were arranged in a gallery around the auditoria, and projected their pictures on 1/11 per circular projection screen. The 9-channel sound was played from a separate 35mm Philips sound reproducer. The projectors and sound reproducer were electronically synchronized through a interlock system. For sound reproduction 51 separate speakers had been installed behind the screen and in the floor. There were room for 500 spectators. The foyer was downstairs with room for a 1000 people. Leonard Urry had set up Circlorama together with Leon Heppner, a Russian entrepreneur who had lived in London for several years. 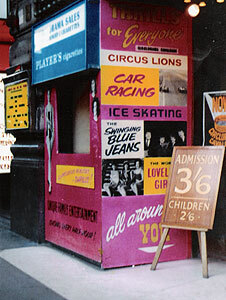 They acquired a bomb site in Denman Street just behind Piccadilly Circus and constructed a building to house the new 360 degree cinema which they had imported from Russia. I remember Leonard telling me the building had cost £120K. It housed the now familiar eleven screens which were arranged round the wall of the circular building. The diameter of the auditorium was 70ft and was served by eleven 35mm Phillips water-cooled, pulse light projectors which were housed in an enclosed gallery. On a level with the centre of the screens the eleven projectors were synchronised to form a continuous 360 degree projected image, and together with a nine track stereo system it was quite a spectacular cinematic experience. The installation had been carried out by Frank Brockliss Ltd who were located in Wardour Street. Mr. Long is publishing his autobiography sometimes in mid 2007. I had known Leonard for several years. He had financed one of my early films "West End Jungle" which was a low budget dramatised documentary destined for theatrical release. The venture had been financially very successful despite censorship problems. 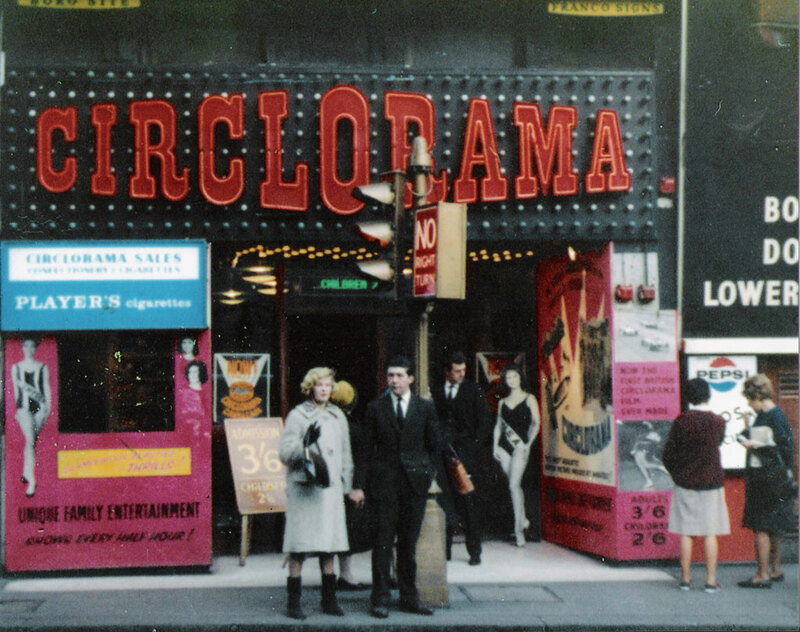 Leonard asked if I might be interested in making a new film for Circlorama, to replace the one which had been running unsuccessfully for about 6 months. The business was terrible he told me, in spite of buying, at great cost, a new entrance from Piccadilly Circus. The problem, he thought was due to the very boring ‘propaganda’ nature of the Russian film. He wanted a lighter form of entertainment with rollercoaster type shots which would be more exciting for an audience, who had to stand in the auditorium to watch the twenty minute show. Being by nature a technically minded film maker (I was a Cameraman) I was intrigued by the prospect. The process didn’t seem too much of a problem to me, and before long, after I had worked out how to do it, I came back to Leonard with a positive interest. I told him that it would require a small budget to make a test in order to make sure it was possible, and to project the result in the cinema, so that they could make a final decision. He agreed to funding a test and within a few days I was busy working out how to go about it. Firstly I worked out the geometry, and found that the eleven cameras would require to be fitted with 35mm lenses to cover the picture circle. The cameras would be mounted on a circular aluminium plate one half inch thick. Synchronisation would be achieved with mains motors. 35mm rig with the eleven ARRIs. Magazines are off (they were being reloaded). Press image for an enlargement. Getting hold of eleven 35mm Arriflex cameras to do such a test proved to be a problem in 1963. A phone call to the new camera hire company run by Sydney Samuelson (now Sir Sydney) and his brothers David and Michael, requesting to rent eleven Arriflexes complete with mains motors driven through a rectifier with a fram meter to hold sync, produced peals of laughter at the other end of the phone. "What an earth are you doing Stanley? I have never heard of anyone needing anything like that number of cameras". When he had calmed down from his initial reaction, I explained why I wanted them and that I only wanted them for one day for the test. He promised to let me know the following day. I had a call at 12 o’clock to say that he had managed to find the eleven cameras but it would have to be on a Sunday when the cameras were not in use although he was having difficulty finding the right number of 35mm lenses as the standard kit of lenses contained only a 28mm lens. He would be short of at least 4. I decided to go ahead replacing the shortfall with 4x40mm lenses which would slightly affect some of the screens. A Sunday was chosen and arrangements made to use a 40ft boat which was kept on the river Thames at Chelsea Reach in London. The cameras were mounted on the cabin roof, and we set off down river to make a series of shots passing the Houses of Parliament and Tower Bridge. We shot in black and white for the sake of economy. Filming a short test film in 35mm B&W to demonstrate the Circlorama system. Scenes included footage made on the Themes river. 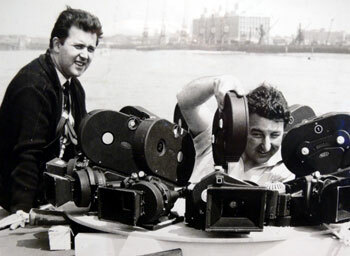 Stanley Long (left) and Don Lord (right) operating the cameras. The film was processed at Technicolor the following day and we waited until the cinema was closed that evening to screen the results. It worked! And apart from the four screens that had the 40mm lenses, the matching was perfect. Leonard and Leon were delighted and a meeting was arranged for the following day to discuss further arrangements for the production and I was to come up with an approximate budget to complete the twenty minute ‘epic’. I worked most of the night on this and came up with a rough figure of what it might cost. One of the problems I had was the availability of the cameras. Obviously it would not be practical to hire them. Also there was another problem. Once the cameras had been mounted in position I would be unable to move them, because every camera has a slightly different gate pitch and changing a camera would mean that the racking would be affected and each time a new shot was done, if a camera had changed, the projectors would have to be adjusted. So it meant that eleven cameras had to be purchased. This of course made the budget sky high. Another problem was that even shooting one take was eleven to one over normal shooting, take two would put the shooting ratio to 22 to 1 not counting run ups etc. The stock cost in colour would be horrendous not withstanding I came up with the final figure which I then presented at the meeting. It was £150.000! more than the cost of the original cinema! Obviously with only one cinema in the country which was capable of showing the finished film, it was a ‘no go’. Even the possibility of selling off the cameras after the production didn’t ease the budget sufficiently to make the project viable. Leonard called me a week later and said the cinema was doing so badly at the box office that they faced closure unless something was done. There was one possibility in that the Russians had a new gimmick. They had fitted Cinemascope lenses to the cameras vertically and produced a new film which used double height screens. A print was despatched to England and Harkness Ltd were given the order to put extra screens in the auditorium. It also meant that eleven anamorphic lens had to be purchased for the projectors. The day arrived when all this was put in place and I was asked to attend the test screening. The whole thing was a disaster, not only was the film content worse than the first one, but the print suffered from racking problems similar to those I knew about when we tried to change camera positions between shots. The screening ended up with the poor projectionists running round the gallery adjusting the racking after every scene. By the time the picture was correctly lined up the scene changed and they had to start all over again. It was a disaster. Leonard came up to me after the screening, his face said everything. "Unless we can sort something out, we’re facing closure." I thought long and hard that evening. How could we reduce the budget? The following morning I telephoned Leonard. I told him I had an idea and arranged to meet him that afternoon. 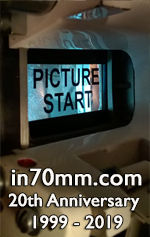 My idea was to change the whole operation over to 16mm! We could buy eleven 16mm cameras for a fraction of the cost of 35mm. The stock cost would be dramatically reduced and likewise the processing. I had worked out some rough figures and it looked as if I could reduce the cost by about seventy five per cent. It meant changing all the projection equipment in the cinema, but the 35mm machines could be sold as replacements to cinemas. So they would be looking at the difference between the cost of the 16mm and the sale of the 35mm ones, plus the cost of the changeover. There was a marginal advantage in that, as we owned the cameras we could make regular changes to the programme. It all sounded quite practical and Leonard and Leon were convinced that this could be the solution. However there would be no going back once the decision had been made, and there was no way we could make tests. It was a simple - go or no go! It was then that I was told where the money was coming from for this whole venture. Leonard acted as a trustee for an eccentric millionaire by the name of Harry de Vere Clifton. 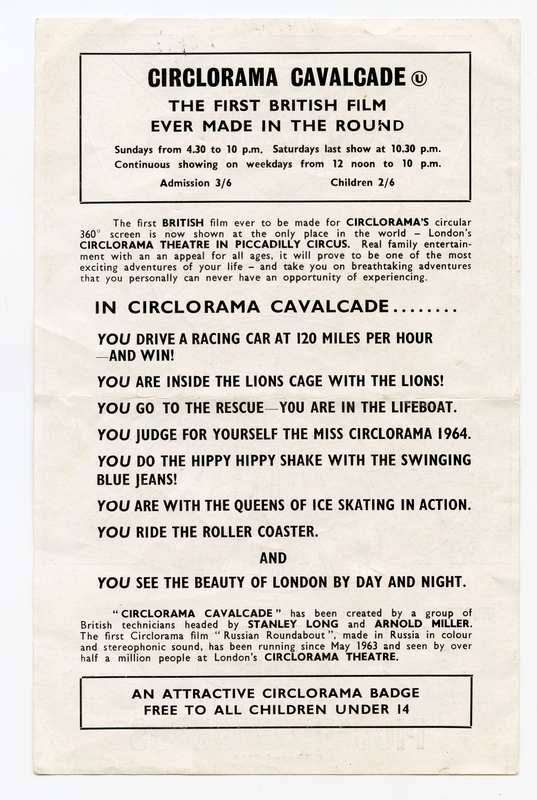 Apparently soon after Circlorama had opened, he had walked on his own from the Ritz hotel Piccadilly to the Circlorama cinema in Piccadilly Circus, paid his 3/6p and went in to see the show unannounced. He didn’t like what he saw, and thought the film should be changed to something more interesting. Leonard had talked to him about me and he asked Leonard to arrange a meeting to talk about his ‘little toy’ as he called it. The ‘meeting’ turned out to be at the Ritz Hotel. "Mr Stanley Long, I have heard all about you, and I am delighted that you may be able to save my little toy from closing. Urry has told me all about your ideas for a new film. Do you know anything about Hobgoblins?" The question was quite out the blue ‘not much I confessed’. ’Oh that’s a pity’ he replied, ‘but I would like a scene with some Hobgoblins. See what you can do’. With that he politely dismissed me. ‘Well off you go and good luck, I look forward to seeing your new film’. I left the room in a daze, this had been the most bizarre meeting I had ever experienced., and certainly the oddest project I had been involved with. I asked Leonard if it had all been some kind of joke ‘No its no joke’ he said. ‘I am trustee to the inherited fortune of Harry De Vere Clifton and the Clifton estate and my job is to look after the crazy whims and investments of Harry De Vere Clifton’. ‘Why then’, I asked ‘was there so much problem with the budget?’ ‘I told you’ he said ‘I have to do the best job I can to control expenditure. Now you go off and make the film in 16mm’. ’And what about the Hobgoblins’? I asked , ‘Oh forget that, he won’t remember’ Leonard smiled. And so it was, that I set out to start the most interesting and challenging job I had ever undertaken. 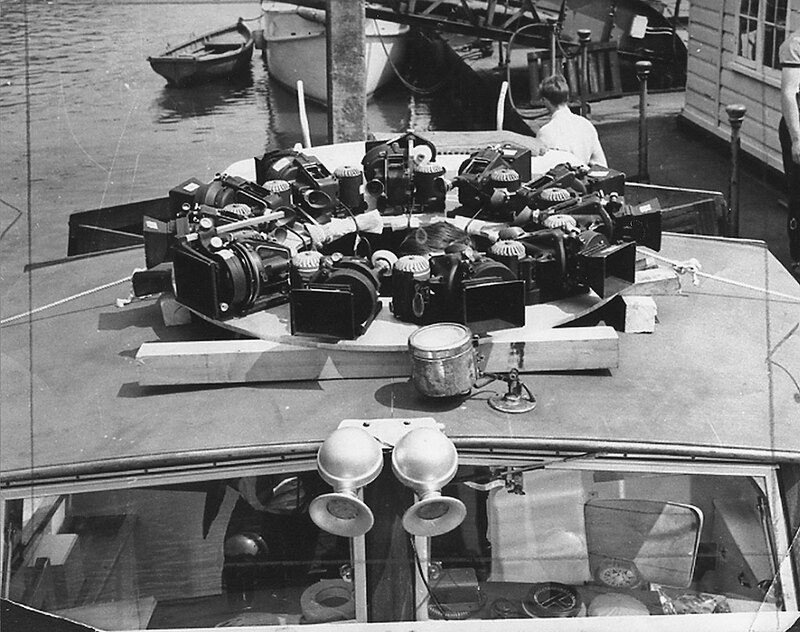 I arrived in Paris later that month to purchase 12 (one spare) Beaulieu 16mm 100’ loading cameras with 15mm lenses. On my return to England, I set about designing the rig which was to hold the eleven cameras and to find a way of keeping them ‘in sync’ during shooting. I tried several ways of doing this including a rather clumsy method of mechanical linkage. Nothing worked. Then I discovered that there was a small synchronous motor manufactured by a company in West London, Evershed Vignoles Ltd, I went to see the technical man there, and I discovered that they could make a gear which fitted into the side of the cameras and it was the perfect solution. I purchased 12 (one spare), and the cameras ran in perfect sync after a short run up. When the cameras were up to speed I dropped a hoop over the rig thereby giving me a reference point to pick up during the editing stage. Then I turned to the problem of editing. Stanley Long with the 16mm camera rig in the middle of Clapham Junction railway lines. Harry Green (Production manager) with back to camera, on the right is an employee of British rail, Don Lord is below Stanley Long fiddling with something, gentlemen and lady on the left are unidentified. I approached Acmade Ltd, a company specialising in editing equipment, and from my specs they constructed a 12 gang synchroniser from 3x4 gang machines. This coped with the eleven picture tracks plus one for sound. The bench was 5 feet deep!! The editor required long arms to reach the back tracks! During this time I was compiling a shot list, which included amongst other things a view from inside a cage of lions (Chipperfield), a scenic railway ride, a shot from the middle of the rail track at the busy Clapham Junction during a rush hour (courtesy British Rail). Try doing that today with Health and Safety breathing down your neck. A lifeboat launch, various shots around London, including a tracking shot from the roof of our camera car going down the Mall with Buckingham Palace in the background and the Horseguards Cavalry in the foreground (with the leader brandishing his sword at our camera car, mouthing ‘f… off’, and a grand finale with ‘The Swinging Blue Jeans’ a popular group of the time, which I photographed at the Leicester Square Ballroom. I also mounted the camera rig onto the back of an E type Jag [Jaguar, ed] and had a racing driver go round Snetterton Race track in the middle of a gaggle of formula two cars. Ice skating from Streatham Ice rink. The skating sequence was filmed at Streatham Ice rink (south London). I rigged the cameras on a mount which had semi circular domes on the four feet, this enabled me to push the rig about on the ice. We had a team of champion skaters doing their bit skating round the cameras about 7 meters from the centre. It all looked great on the screen. of course it was essential for any crew to keep well away from the rig at all times, so I fitted a remote control to the cameras, (this was very useful for the lions cage!!). I remember slipping over on the ice as I came back to the cameras after one take, I suffered for several days with a very sore arse! There was something for everyone and I soon learnt that I could quite effectively manipulate single tracks in the cutting room to simulate the surround effect. An example of this resulted in a comic scene with characters opening and closing doors on various screens around the auditorium. Whilst all this was going on Dr Leslie Knopp a well known expert on cinema design, who had been responsible for the original installation, was busy redesigning the new set up using a 16mm version of the Phillips projector. In order to simplify the sound, I requested that he cut the original 9 track Sondor system using three follow reproducers, with three track heads, down to one machine using one 35mm triple track head. This proved to be as I thought, more effective as the separation of sound was much clearer on three tracks rather than the nine in the original. All these machines were interlocked with a Selsyn interlock which was driven by one master motor and twelve slaves, one for each projector and one for the sound reproducer. The projectors were water cooled and the water jacket encased the rather ingenious lamp which was about the size of a cigarette and pulsed at the rate of 72 x 1 second thereby giving three flashes per frame. This did away with the need for a shutter. These small lamps however never caught on as they had drawbacks not least the problem of not being able to produce a good red on the screen. Therefore all the London buses came out a dirty shade of brown. Experiments with filters in front of the projector lens failed to correct the problem. I suppose these tiny little lamps were the forerunners of the halogen or HMI’s of today? Finally the film was finished, the sound track recorded and the prints were made. I had shot on 16mm Kodak Ektachrome reversal stock and as the film was only made in 3200 K (Artificial light) I had to use Wratten 85 filters in front of the camera lenses when shooting in daylight. The film was processed by Technicolor and because screen matching was imperative, I requested the film go through the processing bath in the same order of the cameras, so that any variation in the process would be gradual around the 360 degree screen. Technicolor were very helpful and did a wonderful job, but all the way through shooting and post production I kept wishing for that 35mm. My goodness, it would have been so much easier! 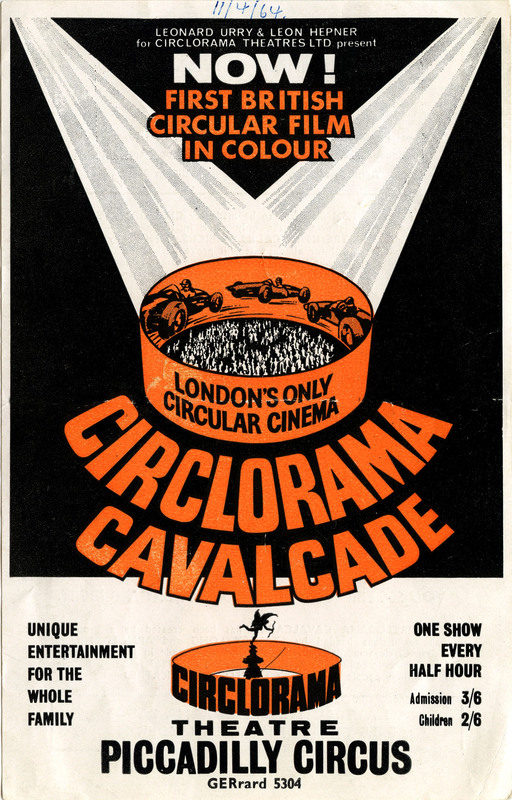 The show opened with the title "Circlorama Cavalcade" and was an immediate success. No doubt much to do with the advertising! Of course it didn’t match up to the 35mm version in technical terms, but I think the content was more interesting to the general public. And it continued to do good business, so much so that Circlorama commissioned a portable version to be made (by the firm of Harkness Ltd) and when the show closed the whole shooting match was erected on the end of the West Pier at Blackpool in readiness for the summer season . Alas this was complete disaster. Not surprisingly the thing kept breaking down being victim to the salt air. It has to be remembered that this was a highly technical and complicated set up and to expect it to operate in such an environment was expecting far too much. I had spoken to Leonard Urry about this when they were thinking of doing it but the installation was not my responsibility and they went ahead anyway. At the end of a disastrous season they were left with a enormous structure on the end of Blackpool Pier, a large loss and a correspondingly large quote from Harkness Ltd to remove it and reassemble in the Kelvin Hall Glasgow in an effort to recoup some of their losses during the Christmas season. Searching for someone who would do a cheaper job and of course someone who was familiar with the system, Leonard once again contacted me ‘Would I give them a quote to remove the operation from Blackpool to Glasgow in time for the Christmas season?’ Now I’ve always been up to a challenge, but this? I said I’d think about it. I then contacted a company, Burgess Lane Ltd in Chiswick West London, who dealt in the repair and servicing of projector equipment and explained the nature of the job. 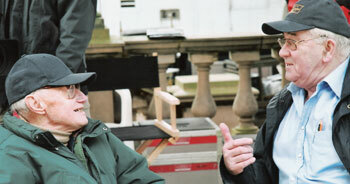 I told the boss Mr Burgess, that whilst I was familiar with the system and had made the film it used, I was totally under qualified for the technical side. Did they have an engineer who would understand this? And would he give me a price for his services for what I estimated to be about a week. A few days went by and he rang me. Yes, he had an engineer who was very good with electronics and would like the opportunity to have a go. He gave me a price which of course excluded expenses. I then cobbled together a budget which would give me a nice profit, then doubled it (because I really didn’t really want to do the job), then I phoned Leonard, who immediately accepted my quote without question. Christ I thought what did Harkness Ltd quote? Knowing the financial state of Circlorama, I asked for 50 percent up front and the balance when the picture was up and running at Kelvin hall. Leonard agreed, said ‘give me your schedule and you can come up and collect your cheque’. I glanced at the calendar. It was the middle of November! I’d have to get my skates on! I contacted Mr Burgess and arranged the job with his genius engineer and said it would be end of November 1965. I had booked two tickets with Dan Air for a flight from Luton to Blackpool and arranged to meet the brilliant engineer from Burgess Lane under the clock at Gloucester Road Terminal at 6pm. As I had not yet met this man, I arranged to identify myself by wearing a white carnation (corny, I know, but it worked). Alan Lavender tapped me on the shoulder at two minutes after six. ‘Are you Mr Long ?’ said this young man, who I judged could have been hardly more than about 17 years of age. ’Yes I am’ I said eyeing him up and down convinced Mr Burgess had sent the tea boy. ‘Do you know about SELSYN INTERLOCK SYSTEMS?’ I asked . ‘Yes I do’ he confidently replied ‘Everyone thinks I’m young, actually I’m 23'. On the flight up to Blackpool in deep technical conversation with Alan I quickly realised that what he didn’t know about electronics wasn’t worth knowing. He certainly was a brilliant technician. 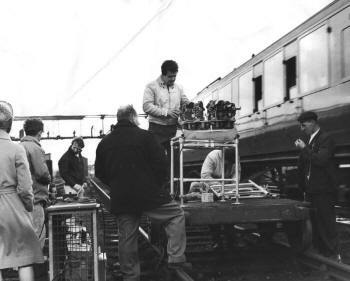 Our first job, as we eyed the massive structure at the end of the Pier the following morning, was to get together a work force to act under our instructions to dismantle and load the whole damn thing onto lorries for the journey to Glasgow. So we visited the local labour exchange and picked a motley bunch of unemployed Irishmen. They were to report for work at the end of the pier at 8am sharp. There were eight in all, but only seven turned up and we set to work. Payment would be made at the end of the day ..in cash. They worked very well and by 5pm we had most of the equipment out. Alan was dismantling and carefully storing everything in the first lorry. Some of it was very heavy and we were glad to have our willing helpers. Photograph taken on Blackpool Central pier, July 1965. Image from Ray Downing. The next day we awoke in our hotel rooms which overlooked the pier, looked out of the window to discover there was a gale which we later learnt was force eight. After breakfast, In our youthful ignorance, we set out for the end of the pier. Out there it was worse, the wind was horrendous but we still set about the task of dismantling the main structure . We must have been mad, stupid or both. All the canvas panels which were fixed by rope to the outer structure blew in the wind like huge sails. It was very difficult to fold the large panels but somehow we managed. The third day was much the same weather conditions but we were now under more pressure having fallen behind schedule. Our next job was to remove the dome covering. This consisted of one piece of heavy canvas, seventy feet in diameter. A huge parachute like piece of canvas held in position by rope at the edges and a metal plate made of steel, about two feet in diameter, at the centre. This in turn was held in place by a large one inch bolt. The dome structure was lowered by eleven winch like columns which held the roof. These had to be gently lowered until the roof was level with the gallery. This is when we could get to the large bolt which held the ‘parachute’ in place. We undid the bolt, the wind got inside the structure and blew the roof canvas up and took the disc with it, tossing it a good 500ft into the air. We shouted for everyone to take cover. The disc hit the wooden deck of the pier just a few feet from some fishermen who were blissfully unaware of what was happening a few hundred feet from where they were sitting. We recovered the disc, which had dug itself vertically into the timber and thanked our lucky stars that no one had been injured. The roof meanwhile was flapping like fury in a full force eight gale. We had to release it quickly or it would have shaken the structure to bits so we decided to undo it from one side in order for it to blow away. When it finally detached from the main structure, it flew into the wind and ended up a mile to the north on the beach. We immediately sent a recovery party, who bought it back on a truck as it was too heavy for four men to carry. Perlux's advert for the 11 screens. Image: CTA Bulletin, July/ August 2011. We had started on the Monday, it was now Wednesday and being winter it was too late to work. By four o’clock we had loaded two lorries and had one to go. It was touch and go whether we would have sufficient space to pack everything into the three vehicles. We did however complete the loading by three o’clock the following afternoon. We had one anxious moment when we realised the bolts which anchored the structure to the pier had rotted due to a season of salt water spray. These would not budge in spite of huge spanners which formed part of our dismantling kit. We solved that one by hiring an oxyacetylene welding torch and burning the buggers off. We waved the three vehicles off at 5pm that afternoon with two of our team on board to look after things. Alan and I took the train to Glasgow in order to arrive ahead of our convoy and also to engage further labour for the erection. After our arrival in Glasgow and fitting ourselves up with accommodation near the Kelvin hall we took a cab down to recess the site where the Circlorama operation was going to be. Bertram Mills Circus’ team was busy erecting a three ring circus adjacent to where our structure was to be. 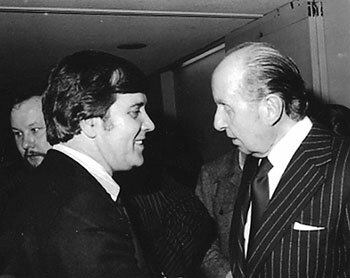 Stanley Long (left) with Leonard Urry c1976. How many of the guys will recognise "The Govenor". The following morning bought some bad news. Our convoy had encountered snow drifts on the Shaps Pass and would be held up until the pass was cleared. This we were told could take days and as we were already behind schedule, we were worried that we could miss the day when we had to complete in order to qualify for the opening day. We couldn’t engage labour until we knew the lorries would definitely arrive. However help was at hand in the form of the rigging team from Bertram Mills' circus. They had already finished their job and by arrangement with Albert du Bois the ringmaster, who kindly offered the services of his team, the moment our vehicles arrived. Which they did after three worrying days. We had in the meantime on behalf of Circlorama Ltd engaged all the staff necessary for the running of the show once it was operational. It included three projectionists on shifts, box office staff and a couple of managers. So far, not bad for two of us plus unskilled labour. Our vehicles arrived in the nick of time giving us just 24 hrs in which to get the whole thing up and running. A daunting task, considering we had taken four days to pull it down and load it on the transport. We geared into action with the help of the Bertram Mills' circus riggers. Soon, at our direction, they were climbing all over the steel structure like a load of monkeys. They were incredible. Alan started to unravel the miles of wiring which he had carefully packed away in Blackpool. He certainly was an electronic genius. It looked as if we might make it after all. We did save a lot of time by not using the steel roof which held the canvas. Instead we hired a block and tackle and suspended the canvas from the roof of the Kelvin Hall and attached it to the perimeter of the structure like a huge Arabian tent. The new staff had been called in to be briefed and Alan fixed in the final connections. We had not had any sleep for nearly 24 hours. We were both knackered, but we had done the impossible. I hurried to telephone Leonard to tell him the good news. He was pleased to hear from me, but in a solemn voice declared he had some bad news. Circlorama had filed for bankruptcy and would be unable to meet all its debts. This was shattering news. ‘What do I do Leonard ?’ He replied ‘I’m sending some money to pay off the staff. Give them a week’s notice and I’ll send enough to cover you above the fifty per cent you have already received. But I’m afraid you’ll have to wait for any further monies until after the creditor’s inspection.’ The cinema staff and the riggers were paid off. Being a major creditor I was invited to sit on the inspection committee which consisted of other creditors besides myself. The late Ray Dutfield, financial director Technicolor later to become Managing Director. The accountant for Circlorama, the late George Winter and various people from, I think, The Board of Trade etc. I’m not much up on this kind of thing but I think the payout was something like two pence in the pound so there was nothing in the kitty in the end. What happened to Harry De Vere Clifton? I have no idea! Leon Heppner died in the eighties. 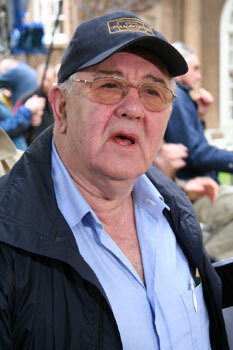 Leonard Urry retired in 1978 and went to live in Spain. He also died in the mid eighties. The structure went to scrap, the projection equipment was sold to various post production film and TV companies for very little, and the cameras were sold to the Ministry of Defence, through a contact of mine, and were fitted into the helmets used by the RAF free fall team!. 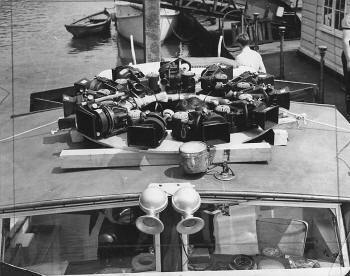 These cameras were ideal because the ones they were using were clockwork with a duration of only 40 seconds whilst the Circlorama cameras could run a full 100 feet of film without stopping. So whilst I lost money I gained a lot of experience, met a good and lasting friend, and had an adventure which I have told many times. But now because Thomas Hauerslev, the editor of in 70mm.com encouraged me to put the memories down on paper, the full information of a most remarkable oddity in the history of film is now available for posterity.